I started by painting my piece with Americana Acrylic Paint in Baby Blue. I did not want the colour to be too dark, as I wanted to add various colours on top. 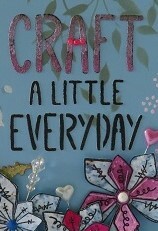 I then used the 'Craft a Little Everyday' Dinky Stencil with some Structure Paste to add my main sentiment. Using the Bubble Background Stencil and some Blackcurrant Sparkle Medium, I added some detail to one corner, and then used some Crackle Medium through a splat stencil to the side. Once the crackle was dry, I replaced the stencil and added a layer of paint in the colour Snow White. Once the mediums were dry, I used a foliage stencil and some Bundled Sage Distress Ink to add some trailing leaves to the top of the MDF. I stamped, coloured and cut some small daisies from the Daisy Days Stamp Set to add to the leaves. I coloured the sentiment with Lavender and Dark Orchid Starlight Paint, adding some pearls to the letter 'A'. At the bottom of the upright I added some PaperArtsy Jofy 50 flowers and decorative pins. To make the flowers I used some PaperArtsy Infusions on Watercolour Card, stamped the flowers heads onto this and then cut out. The 'wheat' like sprigs in the background are Art-Cutz coloured with Starlights. The final touches were some splats to the base, all created with various colours of Sparkle Medium, and some PaperArtsy flowers (sitting just behind the Jofy blooms and to the right). To make the flowers I pushed a Versamark Ink Pad through Stencil PS060 directly onto the MDF. I then sprinkled WOW Embossing Powder in Fuchsia Fusion and White before heat drying. Phew! Yes, that was a lot of products! I didn't really start out with a plan, I just wanted to add some of my favourite products all on one piece as a reminder of what I have...or at least some of it! It is one of those projects you make just for you, for fun, or maybe to inspire someone else, or as a gift? I love all the MDF uprights; I have a feeling there may be less birthday cards made this year and more of these! Labels: Americana Acrylic Paint, Art-Cutz, crackle medium, Distress Ink, Imagination Craft Stencil, Infusions, Martina Tidball, PaperArtsy, Polkadoodles, Sparkle Medium, Starlights, structure paste, That's Crafty!, WOW!